It has been known that sleep goes in cycles since as early as 1937, and the distinction between REM and non-REM sleep was established in 1953. Since then, the various sleep stages have been defined and redefined until we have the breakdown of types and stages we know today, as has been described in the preceding sections. The particular sleep architecture of an individual over the course of an average night – the overall sleep time, the structure and pattern of sleep stages and phases, the time spent in non-REM and REM sleep, the timing and organization of sleep cycles, etc – is best illustrated by means of a hypnogram (see example below), a simplified graphical representation of the results obtained from a more detailed polysomnogram over a complete sleep period. Sleep progresses in a series of four or five more or less regular sleep cycles of non-REM and REM sleep throughout the night, sometimes referred to as ultradian rhythms (“ultradian” meaning within a day). The first sleep cycle is typically around 90 minutes in length, with the succeeding cycles averaging around 100-120 minutes, although some individuals may have longer or shorter average cycles, and they are usually shorter in children. 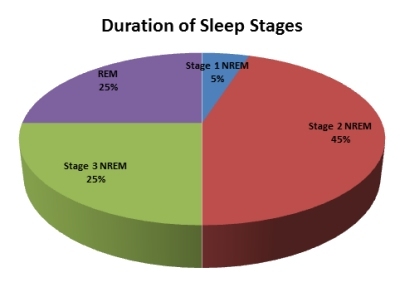 Each cycle follows the stages of non-REM sleep (stage 1 – stage 2 – stage 3) and then, after a period in deep stage 3 slow-wave sleep, back through the stages (stage 3 – stage 2 – stage 1). Then, instead of waking, the sleeper may enter a short period of REM sleep, before going back through the stages (stage 1 – stage 2 – stage 3) in a new cycle (see the hypnogram below). As the night progresses, the time spent in deep stage 3 sleep decreases and the time spent in REM sleep increases, so that there is a greater proportion of stage 3 sleep earlier in the night, and a greater proportion of REM sleep later in the night, particularly during the final two sleep cycles. Generally speaking, the deeper the level of sleep, the slower, stronger and more synchronized the brain waves become, so that a sleep cycle can also be thought of as a progression from the beta and gamma waves of wakefulness, through alpha and theta waves, to the delta waves of slow-wave sleep (and back again). Also, the deeper the level of sleep in the cycle, the higher the arousal threshold, so that it is quite difficult to wake someone in stage 3 sleep, but relatively easy in stage 1 or REM sleep. There is also a general tendency towards decreased muscle tone as deeper and deeper sleep stages are achieved, although in this case REM sleep is anomalous in that muscle tone is at its lowest during that stage (despite its relatively high brain wave activity and low arousal threshold). Each sleep stage in any particular sleep cycle fulfills a distinct physiological and neurological function, each of which appears to be necessary for the health of the body and mind, to the extent that, if sleep is interrupted or if certain stages are missing for any reason, their physiological functions are not fully executed, and the person may feel tired or groggy even after an apparently sufficient sleep period, a phenomenon known as “sleep inertia”. 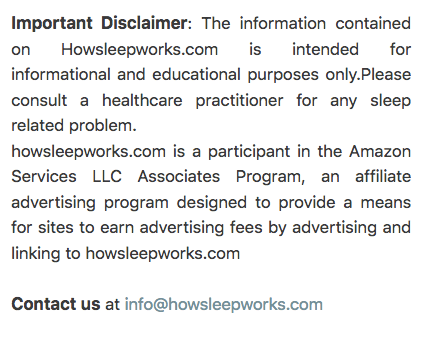 In recent years, special alarm clocks have become available which purport to monitor a person’s sleep stages and cycles and only wake them during periods of light sleep, when the deleterious effects of this sleep inertia are least acute. Sleep trackers may also be used to give a better idea of sleep patterns. They’re not 100% accurate, but they do help the user to understand their cycles more effectively. Napping is also a good way to recover from fatigue, but it’s best to avoid resting for an entire sleep cycle. A break of 15-20 minutes is proven to be more effective, and the body won’t suffer from sleep inertia after such a short period of time. As REM sleep only begins after 90 minutes, the arousal threshold will still be high after a quick nap. sleep is complete. For example; adults spend roughly 20% of their time in at the REM stage of sleep, and for babies it can reach up to 50%. The amount of time spent in each cycle and stage will vary from person to person. Just like babies and adults, different situations call for a variety of different cycles. The cycle is also resilient to change, to the point where attempts at systemic alteration with drugs had little effect on the subject. Sleep cycles aren’t to be messed with, no matter how hard humans have tried. Sleep deprivation and a poor sleeping pattern can also contribute to sleep paralysis. This phenomena is attributed to REM, although it occurs while the person is awake. They’re left unable to move, and they may have difficulty breathing. Sleep has generally been a difficult subject to understand, but coming to terms with the cycles has allowed us to gain insight into what makes it so important. Research suggests that the brain is constantly interpreting data whilst the body is comatose. Animal testing has also shown that the data changes according to the current stage of the sleep cycle. It’s important to rest every day, and to catch up on lost sleep cycles whenever possible.